Below is a picture of the results of my hard work last night. 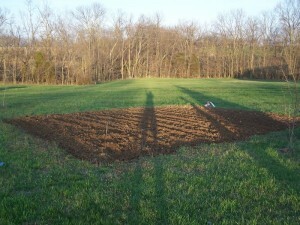 We are ready for planting and I am excited for food production this year. There is just such a good feeling and satisfaction from growing your own food. It has been a while since I have posted about my morning commute drive in. And this morning I have reason to write — it was truly spectacular. It started off with the big orange ball right above the horizon. Except the big orange ball I am referring to is the full moon. It was suspended just above the stick treeline, its orange luminescent sphere radiating against the dark blue western sky. It was so beautiful that I had to call home to let the Mrs. in on the beauty of God’s creation this morning. A few miles after spotting the lunar scenery I passed by two ponds that are a part of my every day commute. A wispy mist hung above the ponds and on one of them I spotted a lone white swan. Again, another beautiful example of God’s creation this morning. And further into work as I cruised along the Gene Snyder freeway I was glowed by another ball of orange, this time to the east in the form of the rising sun. It slowly elevated so as to illuminate the day which was off to a very fine start. I pray that you were able to stop for a moment and marvel at the beauty of God’s creation all around each one of us. If not, don’t wait until tomorrow morning. Start now. This church sign is in honor of my wife. She is currently on her Emmaus Walk. On my Emmaus Walk two weeks ago, she included this church sign in my letter that I received Sunday afternoon. It is very appropriate and applicable. As I stated in my post last night, this morning I had a few things on my list to do early. One is the Men’s Breakfast and Bible Study which I will be leaving for very soon. The other was prayer time in support of this weekend’s women’s Emmaus Walk. During my time of prayer, two words came to me — genuine and obedient. Saturday is a special day in your Emmaus walk with Christ and those two words ring ring true for me in my days following my walk. I pray that today, while the women are strengthening their faith and walk in Christ, they empty out their heart and let Jesus in to clean, heal and build a temple inside them where he can reside and do His work. That is the genuine part. The obedience then comes after as Christ uses broken vessels like us to do His work here on earth. He will give us the means. He will give us the path. Our only job is to be obedient. I pray those two words for the women this weekend. As well as for me, my family and each person reading this. With my better half gone on her Emmaus Walk, I worked from home today and spent the afternoon and evening with the family. I was able to get some work done as well as attend a couple of conference calls. With that done, we had planned a relaxing family movie night at home. Those plans were shelved when R accepted an opportunity to serve dinner at the women’s Emmaus Walk. Of course I could not say no, so all evening plans were altered to allow for getting her to church in time for her to meet her ride. And rather than head home only to have to head back out to retrieve her, K, D and I grabbed some grub in town. And I surprised them with some fishing at a local park. It was our first fishing of the year and a bit nippy out. While we didn’t get any bites, we killed some time and had some fun. While waiting for R to arrive back at church we played some tag in the grass. Soon enough R returned, although we were now behind schedule if we wanted to still salvage family movie night. I was ready to postpone it, especially since my wife hasn’t seen the feature of the week — The Blind Side. However, the kids begged to see it and agreed to get their PJs on as soon as we arrived home. So R, K, D and I sat down on the couch and thoroughly enjoyed the wonderful story that unfolded in front of us. Knowing that Michael Oher is playing for the Baltimore Ravens, I knew there would be a good ending. Those are the kind of movies I like nowadays. As a side note, if you have not seen the movie, please go buy it, rent it, or stream it from Netflix. It is such a good story and one that we all can take something away from. Note to parents, there are a few parts with language — think another term for donkey and female dog as well as the medical term for a male part. Other than that and one scene in the hood where Michael gets physical, it is a good lesson family movie and I would not let any of that get in the way of featuring this at family movie night. And because I posted a picture of Ashley Judd cheering on Kentucky Wildcat basketball (who won again, by the way), I am also going to post a picture of Sandra Bullock playing the role of Leigh Anne Tuohy. She played it convincingly and did a great job. And now it’s off to bed because I have to get up early tomorrow for the Men’s Breakfast as well as to pray for the Emmaus women because I am on the prayer chart for 6:30am. Also, here is the real family picture of Michael Ohr and his family. During my Emmaus walk, my tablemates and I put on a skit based on one of the talks. The intent was to convey a normal loving conversation with God rather than a pious, rote prayer. So often we put God beyond reach with our rituals and prayers rather than immerse ourselves in an intimate loving relationship with our Creator. Setting: a guy dialing a phone. The text below is a one sided listen in on the phone conversation. Also, note that almost every man attending the walk was away from his wife and/or family. Thank you so much. I appreciate all the love and support you give me. I’d be lost without it. OK. You have a great night too. I look forward to our next chat. Good night. I love you too, God. While I don’t follow college basketball, it is that time of year where, in the state of Kentucky, it is mandated that you follow college basketball and March Madness. And Kentucky was lucky enough to have several teams make “the dance” — UK, U of L, and Murray State among others. I had the tournament on the garage TV this afternoon while I wrapped up the brake pad and rotor job on my car. I was amazed that another #1 UK seed, luckily University of Kansas, was knocked out by Northern Iowa. Way to go! And my wife and I are cheering on the Cats against Wake Forest. Go Cats!